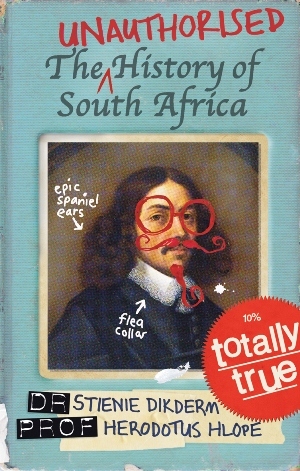 Researched and written by two historians well respected in concentric circles, this hilarious take on our collective past reveals stunning new discoveries and fascinating new figures, from Koos van Doosch, the cheese-pimp who settled the Cape a year before Van Riebeeck, to Shaka’s lesser-known brother, Nigel Zulu, who just wanted to be a florist. You’ll discover how the winner of the Mr Mielie Board beauty pageant came to rule South Africa, and you’ll celebrate our greatest triumphs, like when Matt Damon and Morgan Freeman won the Rugby World Cup in 1995. From small fat gold-plated rhinos in Mapungubwe to small fat gold-plated politicians in Mangaung, The Unauthorised History of South Africa tells you the history you always wanted to know but were too afraid to ask. Dr Stienie Dikderm was born in Bethlehem, in a manger, because there was no room at the Holiday Inn in Welkom. Educated at Dominee Sweepklap se Skool vir Gereformeerde Meisiekinders, she completed her PhD in Historical History, with a thesis entitled Barefoot over the Drakensberg: Toe Jam and Bunions as Cultural Artefacts. She currently teaches Media-Relevant Historical Factoids in the Department of Media and Stuff and Whatever at the Technical University of the South-East, Umhlanga Rocks campus. Professor Herodotus Hlope is a veteran of the Struggle To Get Published, having first stormed the barricades of publishing in the 1980s with a short novel about being young and misunderstood, entitled Being Young and Misunderstood. However, Academia beckoned (she was the manicurist who lived next door) and he married her in 1988. They have two children, Number One and Number Two (Prof. Hlope admits he is ‘not good with names’). Professor Hlope currently lectures in the Department of Relevance and Vibrancy at the University College of Technical Excellence, Boksburg Campus.